What does “progress” mean to the American city? To view photos of progress in Newark, explore the interactive map above. If you are having difficulty using this map, please watch the accompanying video tutorial here. In 1916 and with great fanfare, Newark celebrated the 250<sup>th</sup> anniversary of its founding in 1666. Massive classical columns sculpted of plaster were erected at the city’s main intersection of Broad and Market Streets. Soldiers soon off to WWI marched down Broad Street with Colt rifles in hand. A few months later, women followed in their footsteps carrying banners reading: “The girls behind the men behind the guns.” The United States, though not yet in the midst of Europe’s World War, would soon be at battle and suffer 116,000 deaths, mostly caused by disease and influenza. Women had not the right to vote until 1920 and blacks, then a minority in Newark, lacked some of the basic human rights many of them sadly still lack. Soldiers celebrate Newark’s 250th Anniversary. Soldiers March down Broad Street. The Girls Behind the Men Behind the Guns – Parade of the 312 Infantry Division. And yet the citizens of Newark, alongside much of America, had come to believe that the future held great things in store for them. In a mere fifty years, America had transitioned from an agricultural to industrial economy, developed the world’s most extensive rail system, introduced electricity in every major city, and could boast the world’s largest industries from Chicago’s packinghouses to New York’s Wall Street stock market to Newark’s 37 breweries, countless tanneries, machine shops, and insurance companies. America had also the world’s most extensive power grid and the world’s most affordable and durable car: Henry Ford’s Model T. The way of life was rapidly changing, often for the better. At this rate of progress, the future looked promising. And as World War One drew to a close in 1919, America told herself that this would be “the war to end all wars” and confidently looked toward the future in hope of unremitting progress. 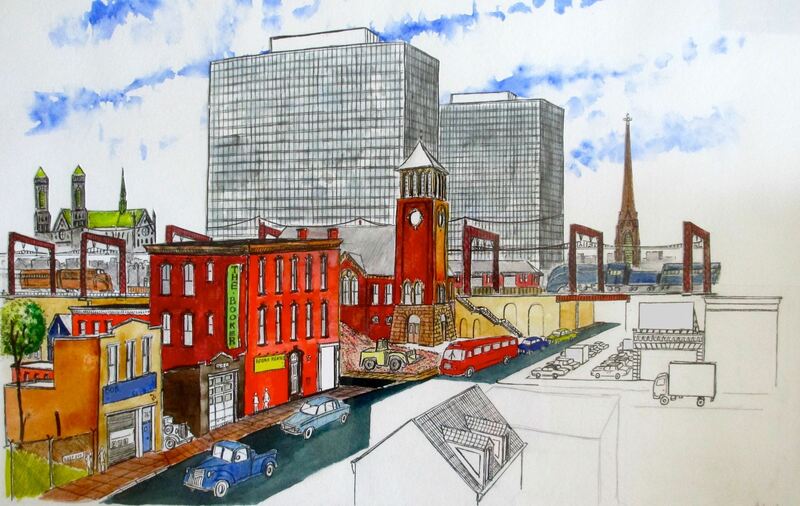 Drawing by Winsor McCary, which first appeared in a 1928 article “Newark 58 Years from Today”- when Newark would be 150 years from the year of its 1836 incorporation as a city. Indeed, leaders of the time predicted what the future would bring to cities like Newark and New York. 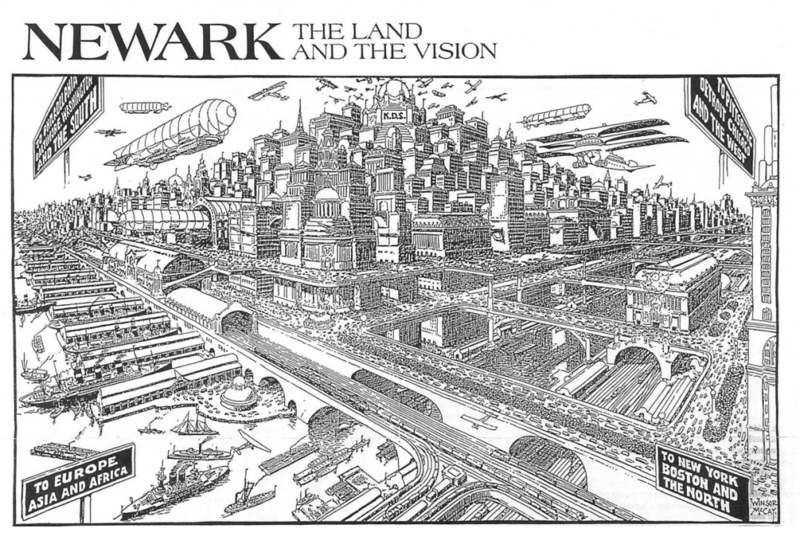 Artists completed whimsical predictions of the Newark of 1986, a city of dense skyscrapers, railroads spewing outwards in all directions, and all manner of blimps and airplanes flying in the sky above. Planners like Harland Bartholomew drafted a master plan of Newark with infrastructure fit for a city of three million (Newark’s population in 1909 was a mere 280,000). Newark corporations like Public Service planned for the future by building the nation’s largest trolley terminal in 1916, capable of accommodating over 300 trolleys an hour. In fact, even the use of the words “future” and “progress” in printed media sharply increased after World War I, peaking around 1920 and declining every following year until World War Two. Now, as Newark celebrates its 350th anniversary in 2016, the city has opportunity to reflect on the past, at the Newark of 1916, and ask: What is the nature of progress? A century ago, progress meant change; progress meant ceaseless improvement and the forward march of society. Today, after witnessing a century with two world wars, an almost fifty-year cold war, decolonization, and the emergence of an interconnected world economy, the implications of progress seem more ambiguous and less naively optimistic. Progress <em>does</em> mean an increasing standard of living, greater educational attainment, and a longer lifespan thanks to advances in public health. But, progress has also led to the decentralization of cities and the loss of distinct urban neighborhoods, processes that continue to play out today. Progress now means many much more than it did a century ago. Unlike the planners and artists of 1916, who predicted that progress would mean the never-ending onward and upward climb of Newark and America, society now knows that progress has not delivered on all it has promised. In many regards, Newark is a better city than it was in 1916. Newark, alongside the New York metropolitan region, is now more interconnected to the world economy. The average age of death has risen from age 50 in 1920 to about age 80 today. And, unlike the 1890s when the US Census Bureau deemed Newark as America’s “unhealthiest city,” Newark citizens now have better access to medicine at the city’s many hospitals. Admittedly, Newark is still a city of great poverty with 79,000 residents (or 28% of the population) below the poverty line. But, being in poverty today is very different from being in poverty a century ago when private charities were the extent of the public’s social safety net and when government did little to aid those in poverty. Our present society is, in many regards, more democratic, more egalitarian, less socially stratified, and a lot wealthier than before. At the same time, often in the same name of progress, Newark has sacrificed large amounts of its cultural and architectural urban fabric. 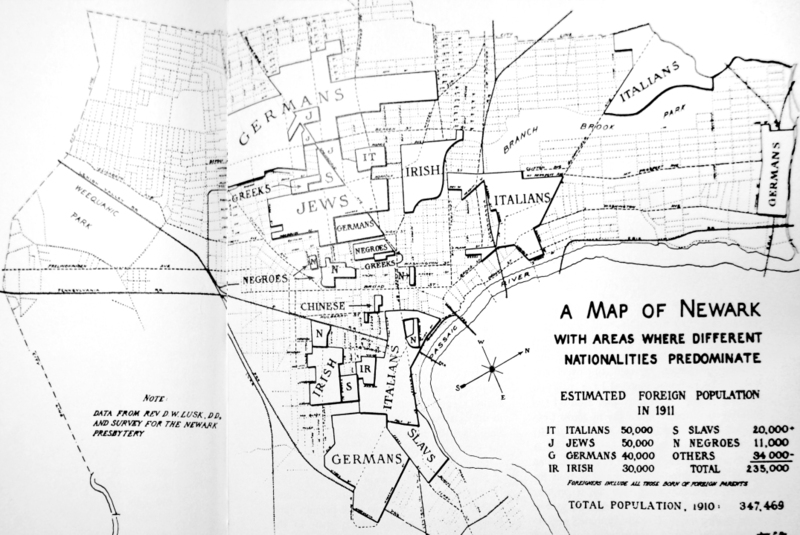 In the 1920s, Newark was home to countless densely built immigrant enclaves. Springfield Avenue was home to Newark’s Jewish community and its many businesses. A few blocks to the North was Newark’s Seventh Avenue Italian Community. And, behind City Hall was Newark’s Chinatown with its restaurants and alleged dens of vice. In the following decades, as the predominantly white population of second and third generation immigrants fled Newark for the suburbs, they left behind them the fabric of old and now empty neighborhoods. With time, many of these neighborhoods fell prey to demolition and urban renewal. For instance, the old Jewish and German communities of Springfield Avenue are now predominantly empty land, low-density public housing, and strip malls. A similar fate met Newark’s Italian community when it was forcefully evicted to construct the low-income Columbus Homes, ironically named in honor of the Italian explorer. Meanwhile, Newark’s Chinatown, Greektown, and other small communities are now largely devoid of large population or are dedicated to the ubiquitous parking lots of downtown Newark (click here for interactive map). 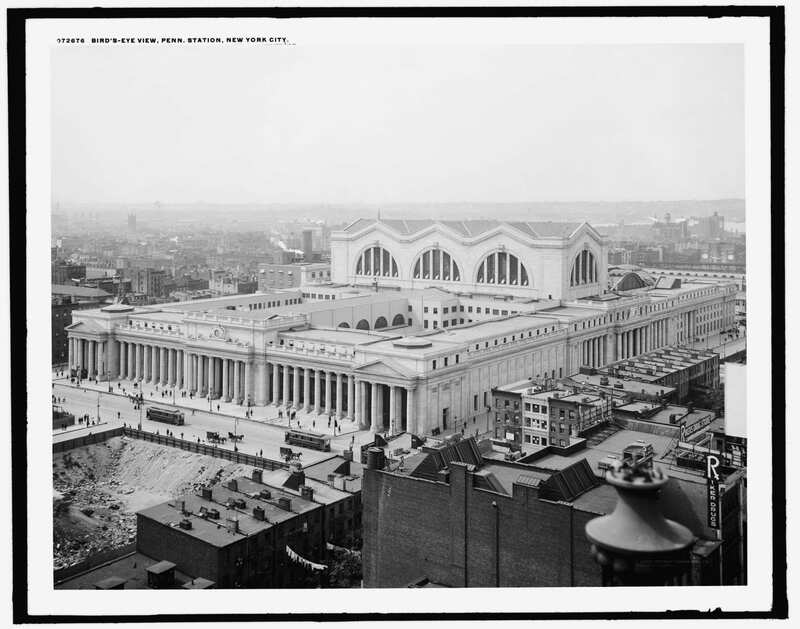 In the belief that the new is inherently better than the old, much of the city’s architectural fabric was outright demolished or replaced by structures inferior to what they replaced, as these images often testify to. The sterile housing project, strip mall, and block of low-income housing are not necessarily more beautiful than the dynamic neighborhoods of churches, businesses, and tenements they replace. Such is the direction progress can take. Downtown Newark in 1873 and 2016. Note the near complete loss of the neighborhood and its replacement by the city’s hockey arena at bottom and parking garage at top. In over a century, all but a handful of the structures pictured in 1873 were demolished. A walk through Newark’s Central Ward will illustrate this direction of development. Let’s take a walk up Springfield Avenue, one of Newark’s major commercial thoroughfares linking the city’s center to its outlying suburbs. We stand in a desolate intersection at the corner of Prince Street and Springfield Avenue. In the distance rise the skyscrapers of Downtown. In front is a wide and street empty of pedestrians. Springfield Avenue slices diagonally through the urban grid, a band of asphalt with the faded markings of yellow and white lines indicating where to drive. On one side, is a vast empty lot now being developed into low-income housing. On the other side, is a low-slung housing project built to replace the decaying urban fabric. The scene is one of near desolation with few pedestrians and thousands of cars. But, a century ago, this neighborhood was a vibrant immigrant community comparable to New York’s Lower East Side. Three and four story tenements edged up on either side of the street. Horse pulled trolleys and then electric streetcars plied up and down this street delivering immigrants to and from work. One block ahead was the Prince Street Synagogue, one of the city’s many vibrant churches and now an empty shell. A few block behind were three of Newark’s largest factories now closed, the Krueger Brewery, Pabst Brewery, and General Electric. Around us were crowded streets and the sound of horses on cobblestone pavement. This neighborhood, among many in Newark, was a dynamic one inhabited by subsequent waves of English, Irish, Germans, Jews, Italians, and finally Blacks during the Great Migration of the 1930s, each generation of immigrants leaving their mark on the built environment. Prince Street in 1916 and 2016 respectively. The complete and total loss of a neighborhood. As the flow of immigrants slowed and as industry ebbed away, this neighborhood has gradually vanished without the people that cared for and resided in it. Industry too slipped away with the consolidation and closure of nearby factories to move abroad, the subsequent loss of employment, and later riots that rocked the city in summer 1967. Newark and its reputation are still recovering from this loss of industry and employment, as the appearance former neighborhoods like this one attest to. Scenes of contrast much like this one play out across Newark to varying degrees. The manifestations of changes to the built environment may vary from street to street and from building to building but the social and economic factors motivating these changes remain consistent: white flight, the automobile, loss of industry, suburbanization, racial tension, urban renewal, among other factors too numerous to discuss in detail. A city is more than its monuments. A city is more than its grand civic structures and skyscrapers. A city is a collection of structures, small and large, wood and stone, humble and grand. Newark has dutifully maintained its large monuments: cathedrals, skyscrapers, and civic structures. But, Newark has not successfully maintained the cultural and urban fabric of its tenements, town-homes, warehouses, and single-family homes. Individually, these small-scale structures are seemingly unimportant. But, collectively, they constitute the living and breathing heart of Newark. Circa 1916, the Prudential Headquarters at left and the City Post Office at right. Both later demolished. My belief is that by examining individual instances of changes to the urban fabric, one can gain a more accurate understanding of the nature of progress in the American city. Though individual instances of say a church’s or factory’s demolition and the disappearance of a neighborhood might seem to be events independent of larger social and historical trends, these individual historic events can and do provide hints and are visual evidence of larger historic movements. 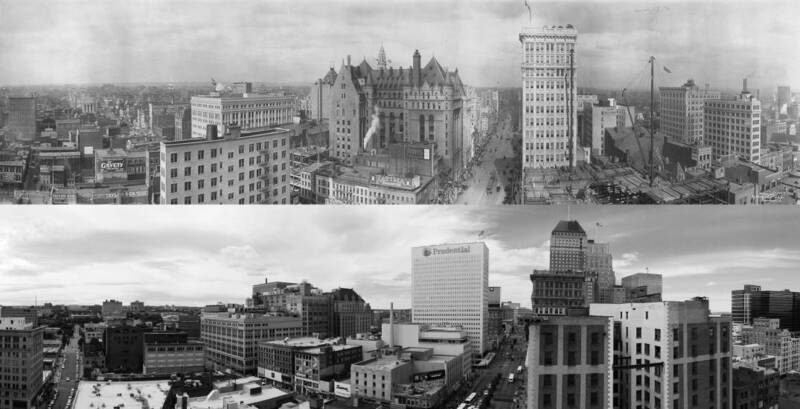 By comparing scenes of Newark then and now, one can start to understand the bigger picture how cities developed historically, how suburbanization and de-industrialization affected the city, and most importantly one can start to question the nature of progress. In many regards, one can examine these images and wish that society still built structures as tall, as proud, and as ornamented as those of a century ago. But, one must also recognize that the built environment of a century ago was the unique product of its time and is in fact inseparable from its era. The same culture and society that laid forth the grand boulevards of Paris, the skyscrapers of Newark and New York, and the vast parklands that surround many American cities, was also a society that denied women the right to vote, blacks the right to participate in society, and colonial peoples the right to govern themselves. In fact, one could posit that the beautiful architecture of early America and its vast public works at the turn of the century would not have been possible without the wealth derived from imperialism, the availability of cheap labor, and the masses of immigrants willing to work twelve hours a day in trying working conditions. To embrace the beauty of the past, one must also recognize the concomitant negatives that made this beauty possible to begin with. We can examine these images of vanished urban fabric of tenements, churches, factories, and densely packed neighborhoods. But, we must recognize that neither past nor present is superior to the other. The built environment of each era is merely the product of its society, culture, and economy. The objective of examining this visual history is not to pass judgment on past or present but to objectively understand where Newark was, where Newark is, and where Newark will be in the near and distant future. A century after 1916, we look forward to the future. Click here for an interactive map about Newark’s vanishing heritage. Prudential and Old Post Office, both now demolished. Downtown Newark in 1912 and almost a century later in 2016. Note that the building at right, in construction in the first image, is now abandoned and awaiting restoration. Murphy Varnish, built in 1886, is one of Newark’s oldest factories still standing. Its elegant brick walls and detailed brickwork reflect a time when industrial structures served more than just utilitarian purpose. They reflect a time when industry was central to Newark’s wealth and key to its future success. Murphy Varnish is not just a factory; it is a monument to industry and beauty built to endure (historically landmarked by the National Park Service). Recent renovation efforts promise to turn this derelict structure into a community of apartments. The summer after my first year at Columbia University, I had the privilege of working with Studio for Urban Architecture & Design (SUAD), the firm hired to redevelop this derelict factory into some 40 apartments. During my time at SUAD, I observed firsthand the workings of a small architectural firm and the inspiring conversion of an old factory into something viable and living. 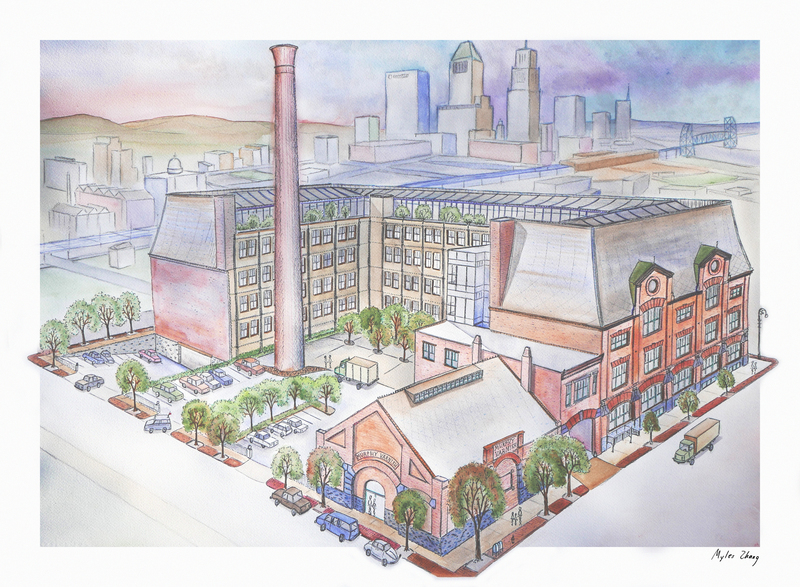 As my internship neared its end, I photographed the historic factory and created a detailed watercolor rendering of the finished conversion, both featured below. During these formative three months, I learned that architecture is more than the creation of art and beauty for their own sake, but a means to build a stronger city and more stable society through inspiring architecture. For decades, Newark has seen architecture that does not connect to the city’s rich history or value aesthetics. Prefab, cookie-cutter homes are often built here, but do not respect their historical or urban context. They are set back from the street with little more than driveways and vinyl siding for decoration. Large corporate monoliths rise in the downtown, but through catwalks and the absence of entrances on public streets, their occupants need not engage with the city. Every morning and every evening, they can ride to and from Newark without setting foot outdoors or on city soil. Even in terms of historic preservation, the city has seen so much of its old architecture lost to parking lots, urban renewal, and urban blight. It is in this context that Murphy Varnish is a unique endeavor in Newark’s redevelopment. In a city once home to thousands of small factories, Murphy Varnish is one of the few that remain. Old maps of the Newark will reveal the presence of dozens of factories in the vicinity of Murphy Varnish and comparable to it in scale. In the past few decades, all of these industrial structures have been demolished and replaced by empty lots and distasteful prefab homes. Now, Murphy Varnish stands alone in a now largely residential neighborhood; it serves as a unique reminder of the past and hopeful beacon for how old industry can be converted into residential. The process of renovation might not be as easy as demolition, but it is in the longer run far more respectful to the neighborhood’s and city’s history. As I begin my second year of college, I return to campus with a greater appreciation for historic preservation. I return with deeper admiration for the tireless efforts of Newark activists and architects to preserve the city’s rich architectural heritage for future generations. Thank you! This project was made possible by a generous grant from Columbia’s Center for Career Education. Murphy Varnish before restoration began. 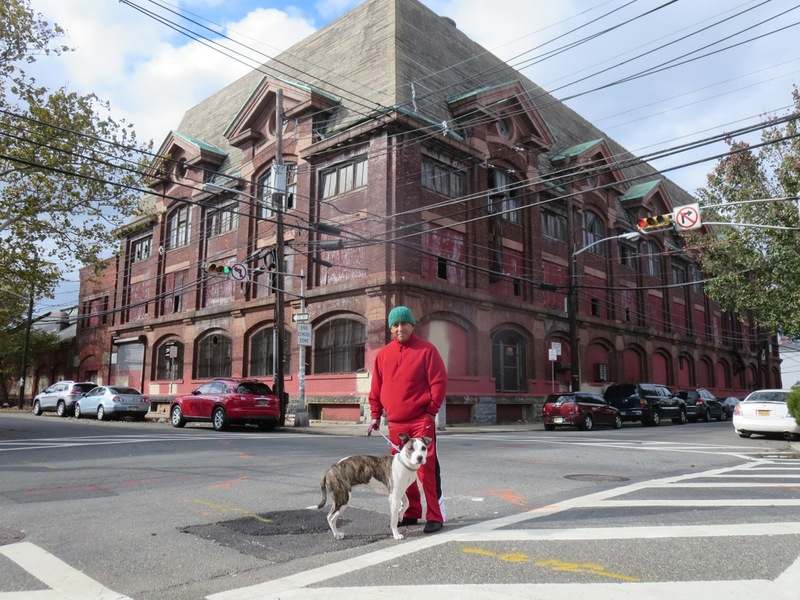 Neighborhood resident Angel and his dog Tigressa stand before Murphy Varnish. Murphy Varnish stands in a sea of empty fields and shoddy Bayonne Boxes. Pedestrian passes by Murphy Varnish. Emaciated tree trunks embedded in the factory’s perimeter fence. 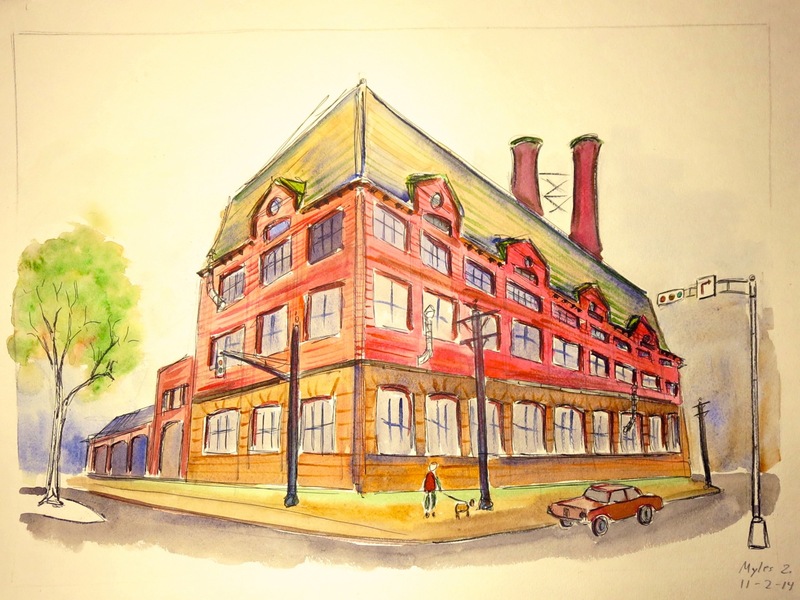 Watercolor rendering completed for SUAD of the restoration project. Say no to Edison Parking! Edison Parking, among many other local institutions such as Rutgers and UMDNJ, has engaged in the systematic destruction of our city’s heritage. In the James Street Commons Historic District, for instance, Edison Parking and Rutgers are the single largest contributors to demolition between 1978 and today, both demolishing dozens of nationally landmarked properties. As Edison Parking continues to consolidate its properties into larger and larger parcels, the question arises: How will this entity develop this land? Will future development respect old Newark and our threatened architectural heritage? These questions remain to be answered. But new development, from Newark’s 200 million dollar arena to Prudential Insurance’s 400 million new headquarters on Broad Street, reveal that our new architecture is often out of time, place, and scale. Too often the name of progress is invoked to justify the destruction of old. But, not often enough do Newark leaders realize that progress is only attained by using the past as the literal building block toward the future. One can walk through Brooklyn or preserved parts of Manhattan and then ask oneself: Where would Newark be had it preserved its architectural heritage? I do not know, but for certain our city would be in a very different position to rebuild its heritage. The degree of what was lost only reinforces the need to preserve what remains. 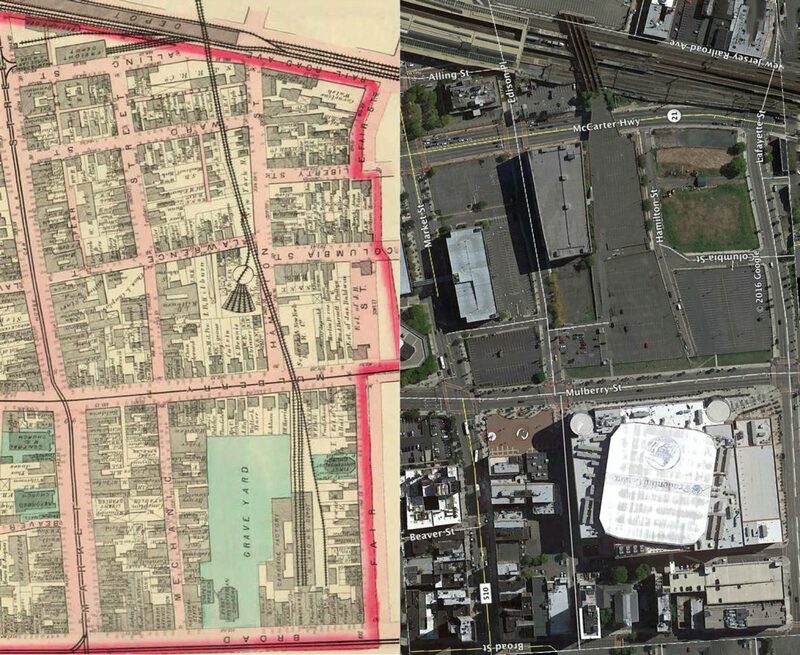 Click here for interactive map of Newark past and present. Below is a speech I gave before the Newark City Council on May 19th. Good evening ladies and gentlemen of the Newark City Council. My name is Myles. I am a proud, lifelong Newarker. Newark is a city surrounded by asphalt. To the south lies our port and airport, comprising 1/3 of Newark’s land area. Our airport handles 40 million passengers a year. Our port handles over a million containers of cargo a year. Both pollute our air. Our city is surrounded by highways: Route 78 to the South, The Parkway to the West, Route 280 to the North, and McCarter Highway to the East. Millions of car travel these congested highways every year. Our urban core is buried in asphalt. Thousands of commuters per day. Millions of cars per year. Edison Parking is beneficiary of this pollution. Their 60 thousand parking spots are valued in the billions. They make millions on the land of buildings they demolished often illegally. They pay no water bills; their water runs off their lots and into our sewer mains. For a company so wealthy; they contribute little to the health of our city. One in four Newark children have asthma, far above the national average. Chances are that your children or the friends of your children also have asthma. I too have asthma. Always had. Always will. Enough is enough. It is time to develop our city sustainably. Public transportation. Public bike lanes. Public parks. Sustainable infrastructure. Edison Parking is not a sustainable corporation. When our zoning board approves of the illegal demolition of our historic architecture, they are complacent in this violation of our law. When our zoning board sits silently as Edison Parking uses our lands for non-permissible zoning use, they are not upholding the laws they are subject to. It is time to change. You, as our elected officials, are in a position to enact the change your public needs. You, as informed citizens of Newark, are responsible for holding corporations accountable to our laws. This is not a question of complex ethics or morality. It is a matter of common sense. Edison Parking has and continues to demolish our heritage, pollute our air, and violate our laws. Edison parking is breaking its responsibility to the public. Will you hold them accountable? Please consider the city you want for our children and our future. In the past 60 years, my home city of Newark has lost 40% of its population and had nearly 50% of its buildings demolished. This urban decay represents both loss, of a more culturally vibrant past state that has decayed into the present, and hope, that something productive can emerge from this now empty land. And yet, the timely and needed development of this land is prevented through a combination of failed government policy, economic downturns, conservative landowners, and inefficient enforcement of land use laws. As a result, hundreds of acres of land remain undeveloped and remain instead as vacant lots — there are more than 200 hectares of paved, surface parking lots in my neighborhood. One of the largest of these lands was formerly an electric factory and has sat empty for nearly 40 years — 25 years as a decaying warehouse and 15 more years as wasteland filled with yellow crabgrass and decomposing trash. For five years, rusting demolition equipment and a towering pile of brick, steel, and construction debris moldered in the center of the lot — visible to the millions of commuters who pass this site yearly, watching day by day as the building gradually deteriorated into a wall of weeds. Then our family decided to experiment with ways to bring a semblance of new life to this tired soil: a garden. But our proposal to cover this raw earth in spring flowers was denied by the site’s owner. Undeterred, on a quiet weekend with few commuters passing by, we walked behind the barbed wire fence to silently sow under the smiling sun. The wondrous flower mixture danced out of the plastic seeder, humming a soothing rhythm. Thanks to more nourishing rain, hope germinated from the infant seeds. Soon, sprouts began popping up hesitantly. At first, the green shoots looked no different from the weeds, but with time they grew taller and flowers bloomed — clover, sunflowers, daisies, and queen anne’s lace. Where once commuters walked pass, now they would stop and take photos of our work, with the city skyline rising in background. Learn more about this project on GoFundMe. Read more about Newark’s urban decay. This project was also featured in the Sine Theta magazine. Read here. Vanishing City is a visual documentary about redevelopment in Newark, my birthplace. While my city’s industrial past slowly succumbs to demolition, new buildings grow from old lots. Through this series, I document the beauty behind decay, destruction, and rebirth. I am witness to the frighteningly beautiful decay of my city’s cultural heritage. An abandoned barge slowly sinks in murky waters. 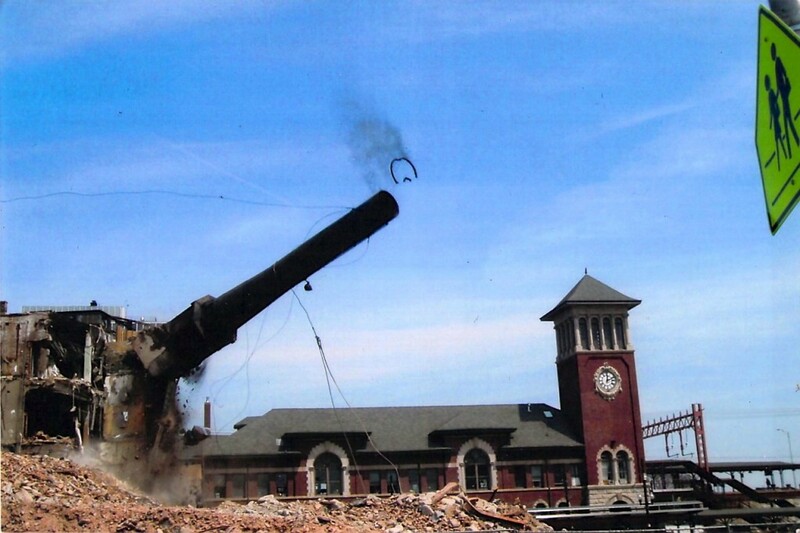 A former factory tumbles before the wrecking ball. A sea of weeds lays siege to a vacant home. An empty lot is a gaping hole, a missing tooth, in the urban body. As a wall crumbles to the ground, a tree, firmly anchored to the wall, reaches to the sky. But, behind this slow decay, there is a hidden beauty in the ephemeral. It is the realization that what was built to last forever, will not last. It is the expectation that the destruction of the past could contain the seeds of a better city. And, it is the hope that someday the past will become cherished in its entirety because a culture without history is like a body without life. Yet, to replace this storied past, the flashy future promised by developers and politicians is hardly a substitute. The so-called “Gateway Center” skirts the city with its corporate skywalks and backdoor facing the city. The blinding glass monoliths that rise in the graveyard of history are alien and indifferent to their city. The proposed casino, in a city where 32% of children are in poverty, speaks to blatant inequality and the excesses of capitalism. The shoddily built strip mall, gated community, and superhighway hardly convey a culture of urbanism and civic consciousness. Developers and politicians promise progress, but bring troubled change instead. The promised rebirth of tomorrow does not justify the ongoing destruction of today. The ephemeral nature of my environment compels me to examine and re-examine my sense of place before it vanishes in the protean vortex of memory. Years from now, my city will continue redefining its identity. Years from now, I will assess my memories with fresh experience and nuanced perspective. And, although today’s present may become tomorrow’s past, the present will survive through our collective consciousness. When one visits the ruins of past civilizations, such as Greece, Carthage, and Rome, one sees them not as whole structures, but as shards of memory and as the detritus of what once was. Their grandeur stems not from seeing them intact but from imagining them as they once were; grandeur lost is more moving than grandeur still extant. These ruins are powerful because of their decay, not in spite of it. The battered past should remind the proud present of its transience. I look at the built world of today and ask: Will the monuments we erect to culture and capitalism endure? What will the future remember us by? Roman roads lasted millennia; will our potholed highways last as long? Obelisks of stone withstood the elements for centuries; will our rusty skyscrapers of steel last as long? The Greek forum became legendary; could the same destiny await our “forums” of today, the strip mall, the grocery chain, and the drive-thru? The Renaissance aspired to the grandeur of Rome; what society will aspire to the “grandeur” of our society with its twisted piles of fallen metal and the troubled environment our children will inherit? Maybe the question should be different: in a culture of blind “progress”, what past will there even be to preserve? Time will tell. Growing up in Newark, I’ve been inspired and saddened by my inner city environment. I am inspired by Newark’s hope of renewal after decades of white flight, under-investment, and urban neglect. But I am saddened by the loss of my city’s historic architecture and urban fabric to the wrecking ball of ostensible progress. “Renaissance City” depicts the Newark of my childhood with garish signage blanketing my city’s architecture in a medley of color and consumerism. On a warm Sunday this August, bulldozers started tearing away at a historic, turn-of-the-century loft space. Although the first floor was sealed with unsightly cinder blocks, the upper floor was adorned with large Chicago windows and intricate terracotta fretwork. In the neo-classical tradition, the structure sported a detailed cornice, white ornamentation, and copious bunting. The building was so sturdy it took demolition crews many hours of pounding and loud smashing to significantly weaken the structure. When the outside walls finally fell, they exposed sturdy concrete floors over a foot thick and hundreds of re-bars for added durability. Situated on the corner of Washington and Bleecker Streets, the 2-story neo-classical structure stood in the heart of the James Street Commons Historic District. Normally, such a structure would never be demolished but . . . The property’s owner is Edison Parking, one of the largest landowners in Newark and New York City. Its owner, Jerry Gottesman, spent $1 million to oppose the High Line. His company also owns Manhattan Mini Storage, whose billboards in New York City read — “Bloomberg is gone. Time to put the bikes away.” To profit from blight, this landbanker buys cheap land, waits for its value to improve, and then profits without doing anything. While waiting, Edison Parking generates huge revenue from surface parking. Often ten dollars an hour for one parking spot. Multiply the results by 60,000 parking spots daily! In fact, demolition is in Edison’s best interest. Real estate is taxed according to the value of the structure, not the land. Therefore, Edison’s huge land holdings share almost no tax burden. Edison doesn’t even pay for storm water runoff, which is calculated by a property’s water consumption. In other words, the public heavily subsidizes surface parking. 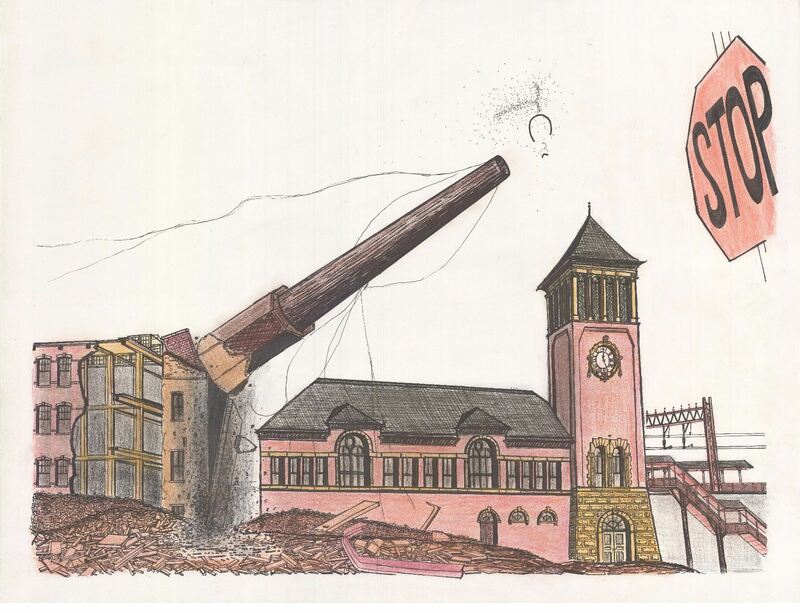 Only under the current land-use policy is Edison’s greed and urban blight rewarded. Edison’s evasion of the law is a high art. In this case, the property Edison destroyed is on the National Register of Historic Places and is protected by local and Federal law. But, this parking mongol quietly acquired surrounding land. Then, it secretly removed the property’s windows and poked holes in its roof. Finally, Edison hired an unlicensed engineer to inspect the property. Edison then obtained a demolition permit from Newark’s corrupt Engineering Department, without approval from the Historic Preservation and Landmark Commission. In one weekend, this historic building and its many stories were purged from history. When the public noticed the illegal demolition, it was too late. The Landmarks Commission called an emergency meeting to discuss the crisis. Sitting directly behind me was a heavy, suburban lady, obviously working for Edison. Upon learning no city code enforcement officers were present, she whispered under her breath, “Yes! Excellent!” and promptly left the meeting. My name is Myles. I am a life long Newark resident. Parking is a travesty. I have seen . . .
Too many viable buildings demolished in the name of progress. Too many parking lots erected to serve commuters indifferent to Newark. Too many vacant lots awaiting non-existent development. This blight of so-called “development” must stop. 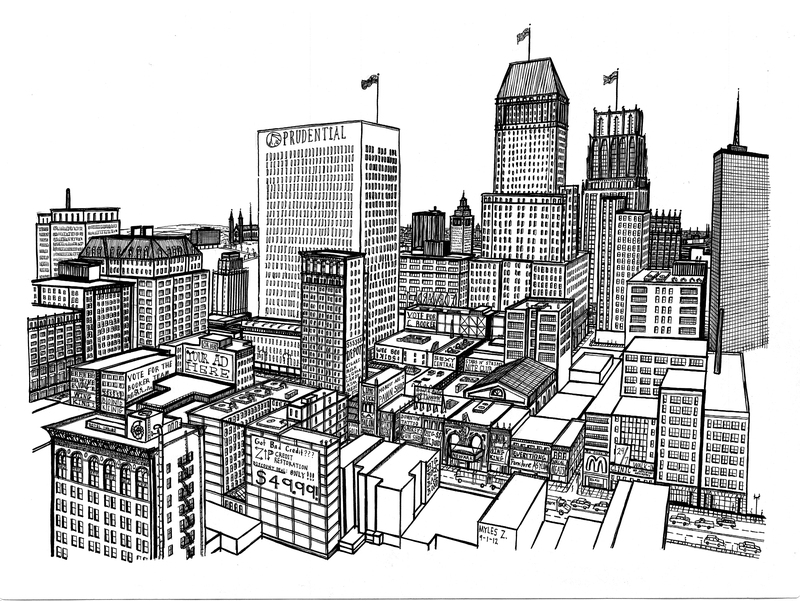 Newark is a city with a strong history. Its buildings are testament to that. Yet, unscrupulous developers’ utter disrespect for our heritage threatens our urban identity. Newark has future potential. Its buildings are testament to that. Yet, unscrupulous land banking slows down the development our city so desperately needs. Newark is a lawless city. Its buildings are testament to that. 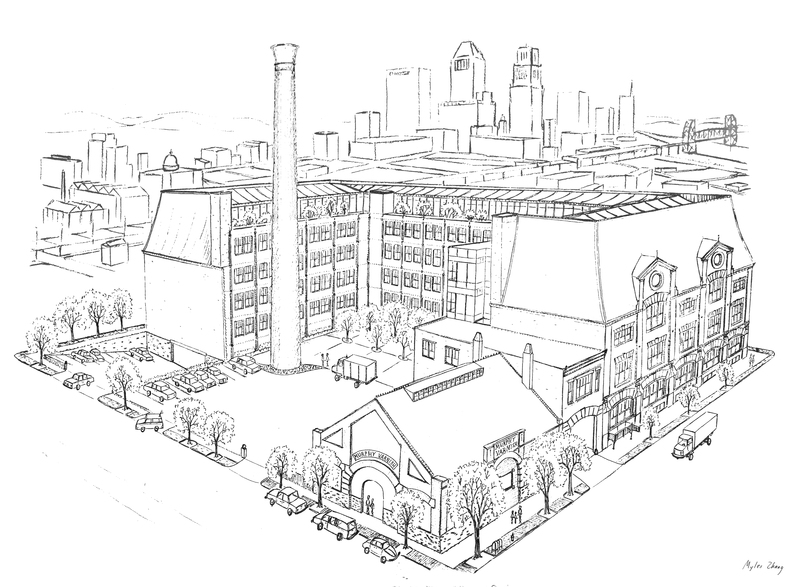 Parking developers have no right to illegally demolish historic structures. They do so anyway. Parking developers have no right to channel millions of gallons of storm water runoff without paying a cent. They do so anyway. Parking developers are not above the law. They think they are anyway. Those who break the law must be held accountable. Letting unscrupulous destruction continue without government oversight is permitting lawlessness to continue. A thief does not think he will be caught. A thief does not stop until he is punished. I realize Newark’s Historic Preservation Commission does not have the power to levy fines or jail these surface-parking criminals. But this commission has . . . The power to lobby for stronger legislation that will protect our neighborhoods. The power to prevent continued parking construction. The power to force corrupt city officials to do their job. I admire the invaluable service you have rendered this city so far. I encourage you to do more. I encourage you to fight these ignorant developers. Even if victories may be pyrrhic, at least there is the comforting knowledge that one fought greed, corruption, lawlessness, and ignorance. In 1978, the James Street Commons were made a historic district. In the Federal approval process, each building was meticulously identified and photographed. Each time I review these images, I painfully remember vanished buildings and our lost heritage. Edison Parking is not alone. Many other institutions in this historic district also contribute to the destruction of public assets and, therefore, to their own identity. For instance, a few years ago, a large public university schemed a land-swap with Jerry Gottesman at this very demolition site. It did so to evade regulations preventing state institutions from demolishing historic structures. As a result of this short-sighted practice, this university has painfully transformed itself into an inferior commuter school, a trend it now tries to reverse. Detroit is living misery. It is the very antithesis of urbanization and a victim of America’s senseless auto culture. Thousands of homes lie vacant and decaying. Copious infrastructure built to serve millions serves only thousands. Highways slashed through decaying neighborhoods serve a city devoid of life in many parts. Downtown is a skyscraper graveyard full of empty storefronts and a labyrinth of rotting art deco architectural gems. During WWII, Detroit was dubbed “the arsenal of democracy” for all the military equipment it rolled out. Planes from Detroit went on to bomb European cities (like Dresden) to smithereens. In a form of fitting, yet ironic, justice Detroit has been bombed to smithereens. Except this time, it isn’t a B-27 doing the dirty destruction, it’s a culture of decay and the very society that erected this metropolis. Black Power mural welcomes visitors. After Detroit’s 1967 Riots, over 200,000 whites fled Detroit for good. They left behind a racially divided city. They wiped their hands clean of decades of corruption and let the “blacks manage themselves.” White corruption became black corruption. Out with the old rascals and in with the new. And the birthplace of the automobile plummets ever lower. Attempts to rectify Detroit’s fallen stature make a mockery of progress. An empty monorail endlessly circles a downtown devoid of life. Renaissance Center soars above downtown, secluded from the helpless city. Renaissance Center is a corporate Death Star accessible only by car. The ominous Greektown Casino abuts the city jail. Whites commute to Detroit for sports games at Comerica Field and then flee afterwards. Everywhere there is parking, parking, parking . . . Detroit billionaire Dan Gilbert even proposed creating a demolition countdown clock that listed the number of vacant buildings to be demolished. Ten-year-old pumps his own gas. The atypical homeless lady: white & blond. Man waits to cross Woodward Ave. Homeless shields himself from camera’s stare. Detroit is a failure on countless levels. It represents the failure of government to stem the victorious forces of suburbanization and cars. It represents the failure of short-sighted planning and American industrial might. It represents the failure of democracy to level the playing field of racial divides. De facto segregated Detroit has become de jure segregated Detroit. Detroit is by all means a failure. Then and again, the forces causing the downfall of this metropolis are just as guilty. Government. The free-market. The auto industry. Capitalism. We Hope For Better Things; It Shall Rise From the Ashes.